It has been revealed by Brendan Hughes in this morning’s Irish News that the cost of the defective injunctions brought against unionist cultural expression zones in east Belfast was a staggering £4,500 of tax payer’s money. The injunctions, which were never affixed and therefore never took effect, were allegedly supported by all parties in Belfast City Council. To date council have refused to release the minutes or attendance list of the meeting in which this decision to target unionist cultural expression zones was made. Many people will be horrified at the vast amount of tax payer’s money wasted pursuing the injunctions at the behest of the ‘progressive’ Sinn Fein-Alliance party pan-nationalist coalition. 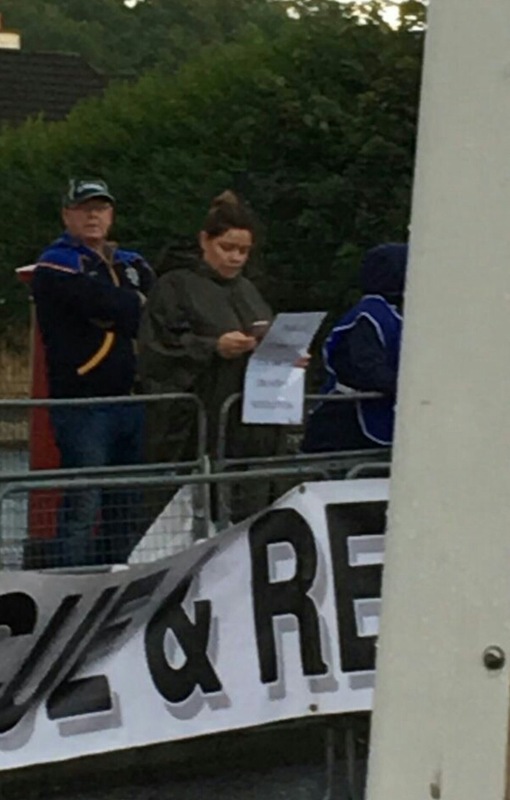 Michael Long of the Alliance party alongside ‘progressive’ Sinn Fein colleagues Deirdre Hargey and Jim McVeigh- a convicted terrorist- were the driving forces behind the sinister targeting of the sites. The failure of the injunctions to take effect was highlighted, much to the embarrassment of Belfast City Council, by the East Belfast Community Initiative. In a written submission to Belfast City Council the EBCI highlighted numerous flaws in the cultural targeting injunctions. Unionist Voice will continue to campaign for the release of all documents relating to the disgraceful targeting of unionist cultural expression zones and the attendance list and voting record of those present at the meeting when the decision to target unionist culture was taken. 100 Responses to "NEWS: Cost of SF/Alliance targeting of unionist culture revealed"
With havin so much content and articles do you ever run into any problems of plagorism or copyright infringement? My website has a lot of completely unique content I’ve either written myself or outsourced but it seems a lot of it is popping it up all over the web without my authorization. Do you know any methods to help prevent content from being ripped off? I’d definitely appreciate it. Hey there I am so delighted I found your blog, I really found you by accident, while I was browsing on Aol for something else, Nonetheless I am here now and would just like to say thank you for a marvelous post and a all round exciting blog (I also love the theme/design), I don’t have time to look over it all at the moment but I have saved it and also added your RSS feeds, so when I have time I will be back to read much more, Please do keep up the superb job. There are certainly a whole lot of particulars like that to take into consideration. That is a nice point to convey up. I supply the ideas above as common inspiration but clearly there are questions like the one you carry up where crucial thing might be working in trustworthy good faith. I don?t know if greatest practices have emerged round issues like that, but I am certain that your job is clearly identified as a good game. Both boys and girls really feel the affect of only a second’s pleasure, for the remainder of their lives. Just desire to say your article is as amazing. The clarity for your post is just spectacular and that i could think you are a professional on this subject. Well along with your permission allow me to seize your RSS feed to keep up to date with coming near near post. Thanks a million and please keep up the rewarding work. Hello! I know this is kinda off topic however , I’d figured I’d ask. Would you be interested in exchanging links or maybe guest authoring a blog article or vice-versa? My site covers a lot of the same subjects as yours and I believe we could greatly benefit from each other. If you’re interested feel free to shoot me an e-mail. I look forward to hearing from you! Wonderful blog by the way! Hello there, just became aware of your blog through Google, and found that it’s really informative. I?m going to watch out for brussels. I?ll appreciate if you continue this in future. Numerous people will be benefited from your writing. Cheers! Hello There. I found your blog the usage of msn. That is a really neatly written article. I will make sure to bookmark it and return to read extra of your useful info. Thank you for the post. I will certainly return. more, “pop”! Your content is excellent but with images and clips, this website could certainly be one of the very best in its niche. I am really loving the theme/design of your blog. Do you ever run into any internet browser compatibility issues? A small number of my blog readers have complained about my website not operating correctly in Explorer but looks great in Firefox. Do you have any suggestions to help fix this issue? Hey very nice website!! Man .. Excellent .. Amazing .. I’ll bookmark your site and take the feeds also…I’m happy to find so many useful info here in the post, we need develop more techniques in this regard, thanks for sharing. . . . . .
Hi there, just became alert to your weblog thru Google, and found that it’s truly informative. I am gonna be careful for brussels. I will appreciate when you proceed this in future. Lots of other folks will probably be benefited out of your writing. Cheers! It’s awesome in favor of me to have a website, which is good for my experience. as I’m planning to create my very own site and want to find out where you got this from or just what the theme is called. I was recommended this website via my cousin. I’m not certain whether or not this put up is written via him as nobody else recognise such detailed approximately my trouble. You are wonderful! Thank you! Do you mind if I quote a few of your articles as long as I provide credit and sources back to your weblog? My blog is in the very same area of interest as yours and my users would genuinely benefit from a lot of the information you provide here. Please let me know if this okay with you. Thanks! Awesome blog! Do you have any hints for aspiring writers? I’m planning to start my own website soon but I’m a little lost on everything. Would you propose starting with a free platform like WordPress or go for a paid option? There are so many options out there that I’m completely overwhelmed .. Any tips? Kudos! Hi! This is my first comment here so I just wanted to give a quick shout out and say I genuinely enjoy reading your blog posts. Can you suggest any other blogs/websites/forums that cover the same topics? Thank you so much! Hello there, I found your web site by means of Google whilst looking for a comparable topic, your site got here up, it appears to be like great. I’ve bookmarked it in my google bookmarks. Do you mind if I quote a few of your posts as long as I provide credit and sources back to your website? My blog site is in the exact same area of interest as yours and my users would genuinely benefit from some of the information you present here. Please let me know if this okay with you. Regards! Howdy! I know this is kinda off topic but I’d figured I’d ask. Would you be interested in exchanging links or maybe guest authoring a blog post or vice-versa? My site discusses a lot of the same subjects as yours and I feel we could greatly benefit from each other. If you might be interested feel free to shoot me an email. I look forward to hearing from you! Awesome blog by the way! Greetings from Carolina! I’m bored to tears at work so I decided to check out your blog on my iphone during lunch break. I really like the knowledge you provide here and can’t wait to take a look when I get home. I’m shocked at how fast your blog loaded on my cell phone .. I’m not even using WIFI, just 3G .. Anyways, superb blog! Greetings from Los angeles! I’m bored to death at work so I decided to check out your blog on my iphone during lunch break. I really like the knowledge you present here and can’t wait to take a look when I get home. I’m shocked at how fast your blog loaded on my mobile .. I’m not even using WIFI, just 3G .. Anyways, awesome site! F*ckin’ awesome things here. I am very glad to peer your post. Thanks so much and i’m looking ahead to touch you. Will you kindly drop me a mail? Thanks , I’ve just been searching for info about this subject for ages and yours is the best I’ve found out so far. However, what in regards to the bottom line? Are you sure about the source? Hello, for all time i used to check webpage posts here early in the morning, since i love to gain knowledge of more and more.